In Taiwan, a key Israeli ally, Tsai Ing-Wen becomes second DDP president indicating a stronger stance on Chinese hostility. Taiwan on Friday swore in its first ever female president, Tsai Ing-Wen of the Democratic Progressive Party (DPP), who took the January elections by storm. Her inauguration comes even as the southeast Asian island nation is burgeoning into a key ally of Israel, having picked the Jewish state as its first ever partner in a R&D Collaboration Agreement signed in April 2015. 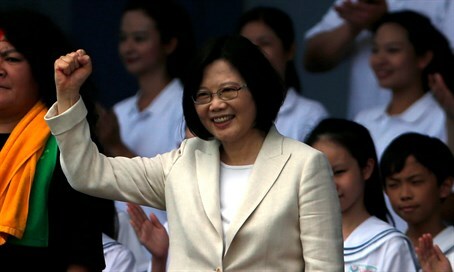 Tsai, 59, is the second DDP president for the country, as the Kuomintang (KMT) has ruled for the majority of the last 70 years since its establishment. DDP tends to have a more independent stance vis-a-vis China, which has threatened to conquer the island, and Tsai's victory reflects public discontent with her predecessor Ma Ying-Jeou's approach to Beijing, as well as his handling of the economy and the widening wealth gap, reports BBC. Addressing the nation after being inaugurated, Tsai said Taiwan proved it is "committed to the defense of our freedom and democracy as a way of life." Focusing on China, she said the "stable and peaceful development of the cross-Strait relationship must be continuously promoted," and she called on both sides to "set aside the baggage of history, and engage in positive dialogue, for the benefit of the people on both sides."